Today's the day we've been waiting for: the 3rd Annual Bead Peeps Swap N Hop! Members of the Bead Peeps Facebook Group were assigned partners and swapped beads. We were to send at least one artisan component. 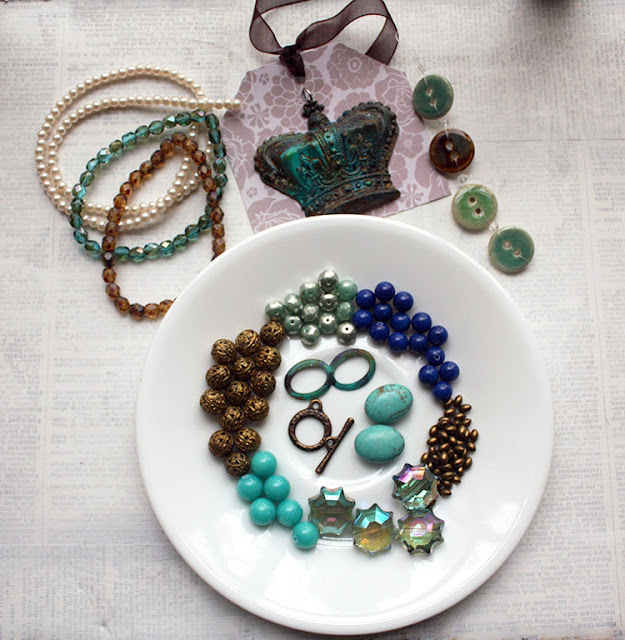 As well, the packages had to include a focal, a clasp, and/or beads. I was partnered up with the fabulous Kari Asbury. The link goes to her Instagram, but you can find more of her beautiful work on her website: KariAsbury.com. Here's the pretties that Kari sent me. You can see these in more detail on my Bead Peeps Swap N Hop: The Exchange post. Kari sent me many, many treasures! Included in the mix were several items made by her, ceramic elements from Gaea, more ceramic pretties from Spirited Earth, a handmade pendant from Tesori Trovati, some WoolyWire, sari silk ribbon, and a bright mix of glass beads. As an added challenge, Linda (the group's administrator and our hostess), encouraged us to have duplicates of what we sent out partners and make something from that. I thought this challenge sounded interesting and always love to see what different artists do with the same materials, so I played along. Here's a look at both what I sent to Kari and kept for myself. 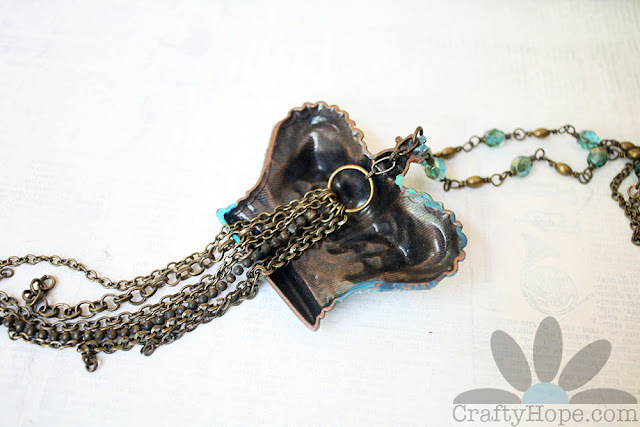 The artisan component in my mix was the crown pendant from Dry Gulch on etsy. I also altered some brass folder rings with patinas in an attempt to make them match the crown. As well, I threw in a brass clasp, ceramic buttons, and a mix of glass, metal, and stone beads. Before I reveal what I made, I want to admit that I didn't use near all the beautiful pieces Kari sent me. There were so many! And, as excited as I was about the wooly wire, I just couldn't decide how best to feature it. However, I did use almost all of the pieces that Kari made herself. They just called out to me. 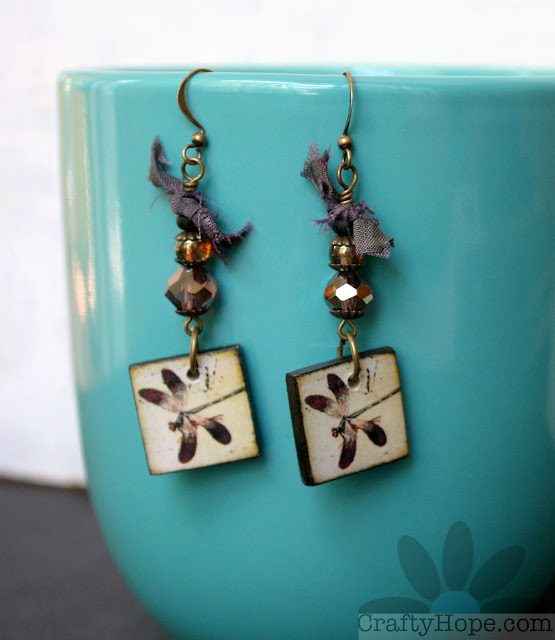 As soon as I got the pictures taken, I knew that the two dragonfly tiles were meant to be earrings. These emerged in no time. They simply fell together! In addition to Kari's dragonfly tiles; I used two small amber-colored glass beads from the mix and small bits of the sari silk she sent. From my own stash, I added brass bead caps, jump rings, ear wires, and violet crystals. Here's another look at these beauties. I stayed in the groove with Kari's tiles and created a simple pendant with a few more of the beads Kari sent and some antiqued copper wire of my own. 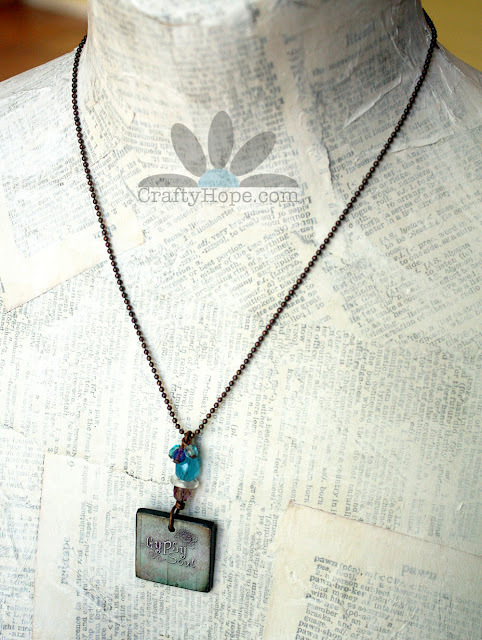 Kari's "Gypsy Soul" pendant told me what colors to use, and I went with it. The biggest hurdle in making this necklace was actually finding copper ball chain, which I was adamant it needed. 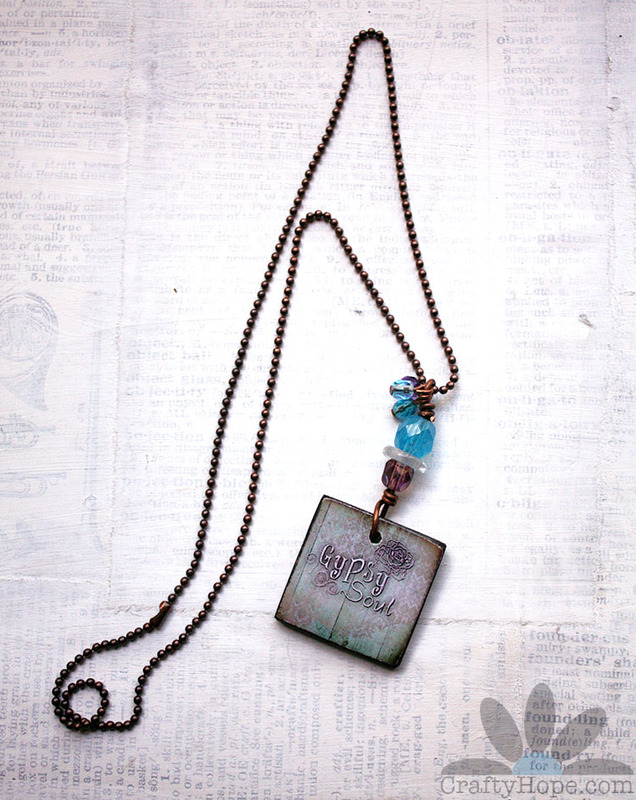 I think it would look lovely layered with another necklace or two for a true gypsy look. My favorite item in the package from Kari was the key with the rhinestones. It was just SO ME! But, that made it even harder for me decide how best to use it. I kept trying to work it into a necklace. However, a spark of inspiration finally hit when I realized that the thin nature of the key would allow me to both bend it and punch a hole in it. With those tasks done, I was able to create this simple bracelet. I aged a piece of thick (16 gauge maybe?) brass wire. First, I formed a hook to work as a clasp. With another piece of wire, I turned loops on either end and bent the rest into a small arc. Antiqued brass jump rings connect everything. I am ABSOLUTELY smitten with this bracelet. It is my precious. Once I had those projects tackled, my attention was turned to the duplicate set. Kari and I both agreed that the crown was a bit of a larger pendant than either of us was used to working with. This was totally my fault because I just didn't pay attention to the size when I ordered them, they were just so pretty!! After some thought, this necklace came together. With some of the same Czech glass beads and brass breads that I sent Kari, I made the front portion of the chain. Antiqued brass chain makes up the back as well as the fringe. The back of pieces always interest me. It's like getting a peek into the inner workings. Since I had to fiddle with the makings of this one to get the fringe to hang just the way I wanted, I thought you should see how I did it. From the jump ring at the top of the crown, I hung a few links of chain. At the bottom of this chain is a large jump ring onto which I threaded the various strands of chain used for the fringe. It worked perfectly. Here's a look at the entirety of the necklace. I decided not to add a clasp to this as it easily fits over any head. And, here's a final (blurry - sorry!) look at all the pieces I made for this challenge. 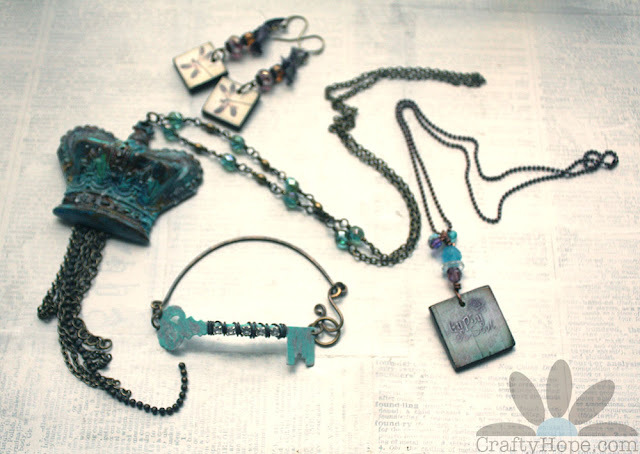 Now, I hope you take the time to hop over to Kari's Blog and see what she created. I know I can't wait. As well, make sure to use the hashtag #BeadPeepsSwapNHop17 as you search Instagram for other reveals, or just hop though the list below!! What FANTASTIC pieces! I LOVE your bracelet! I see why it's 'precious' 😀 Great work! Linda, Oh thank you so much! I so much fun with this challenge. I'm glad you reached out to me. Getting to know and swap with Kari was a blast. And, I'm so pleased with the pieces I made too. Thanks! Now, to get hopping!! Hi Hope, Great job using your swap beads. 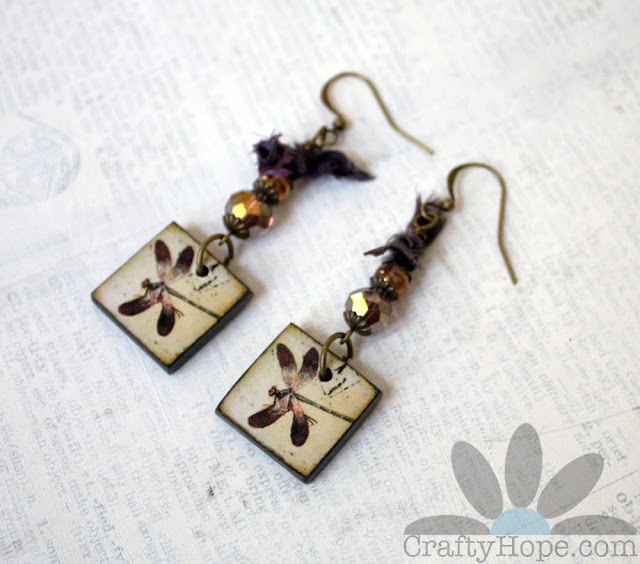 The colors that you chose for the dragonfly earrings are perfect. The key bracelet is my favorite. It is such a creative way to use the key. I like your crown necklace too. Hanging the chain fringe from a jump ring on the back was clever. Becky, Thank you so much!! I was a little spoiled with all the goodies Kari sent, and still have so much to work with. But, I'm so happy with the pieces I was able to get done. I'm glad you like them too. Thanks again!! I LOVE EVERYTHING! I knew you wouldn't be likely to use everything...I always like my partners to have extras for fun later down the road...but I am ecstatic that the pieces I made spoke to you for the challenge! I think the key bracelet is my favorite just because WOW such a unique and beautiful use. It also has potential for layering with other bracelets to change up the look. Funny thing on the crown...even though we both ended up in entirely different directions...I started out in a similar place to where you ended LOL!Great minds and all. I so enjoyed meeting and getting to know you during the pre-hop fun and I can't tell you how much I've enjoyed following your journey in the instagram photos...so fun to see what you share! Kari, You are too kind! I'm pleased that you like the bracelet. I was so worried about bending and punching it that I would mess it up somehow. I'm pleased it worked out so well and that you like it too. Yay. What a relief. That's so funny with the crown. I kept thinking that because of its size, it would need a simple, basic design. And, that's the direction I went. However, you completely proved me wrong with the intricate details you included. I'm looking forward to seeing where you go from here! I really like how you added the tassel to the crown pendant, very clever! I love the crown necklace the best. The chain hanging down from it adds so muck to it. Kathy, Thank you so much!! I had a lot of fun with that design and got to sort through my chain in the process. It was a great reminder of how much I have and really need to use before I buy some more! Ha! Thanks for popping in! Beautifully Done Hope!!! Great designs and so much texture and movement!!! Love them all! Robin, Thank you!! I really enjoyed this challenge as well as the hop! I appreciate you taking the time to hop by!! I like your necklace and earrings a lot. 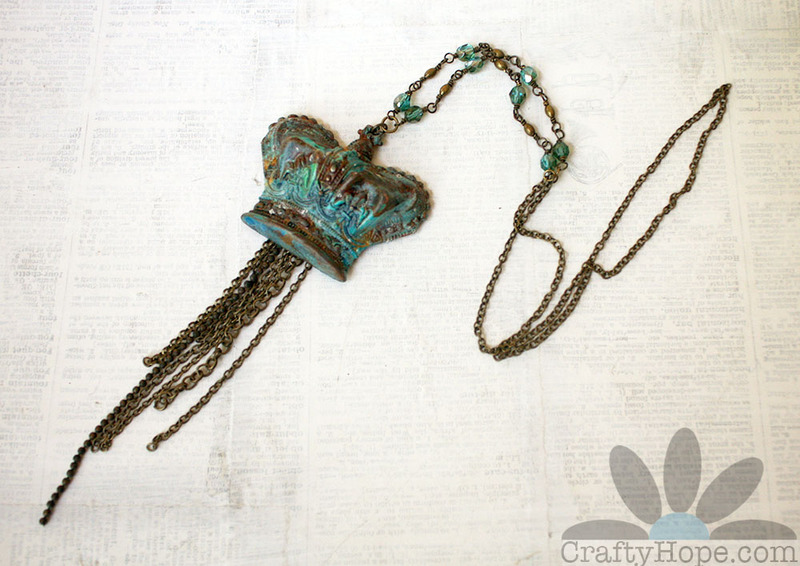 I've used Kari's pendants too and love them. Your necklace with the crown is pretty too. Inge, Thanks so much! Yes, Kari's stuff is so great. Her tiles are a pleasure to use. Thank you for hopping by! You both made stunning necklaces with that magnificent crown. I would have been utterly stumped with a focal that large. I think my favourite though are the delicate dragonfky earrings with their flash of gold. Yum! Ooh I love your work! Gorgeous pieces. I love them all I couldn't possibly choose a favorite! The key bracelet is so fun. You took the key in such a great direction. With that nice gentle curve it looks like it must fit the wrist perfectly. Also, love the dragonfly earrings. Well done! Liz, Thanks! I do like that key so much. And it's just so lightweight and easy to wear. It does fit very well on the wrist. I'm so glad you like those pieces. Thank you for hopping by! 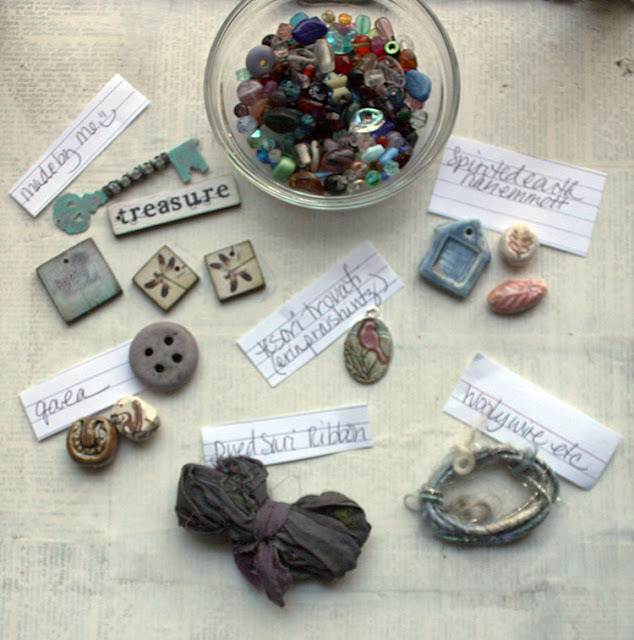 Treasures made out of treasures! 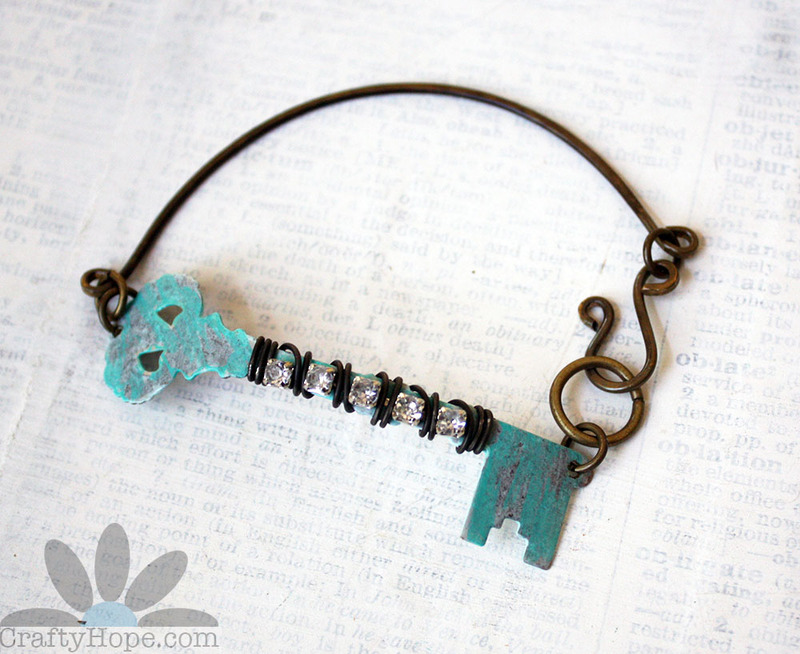 All the pieces have a vintage feel but the key bracelet is center-stage - an absolutely unique design, don't you like it when you play with something and The Idea strikes you! 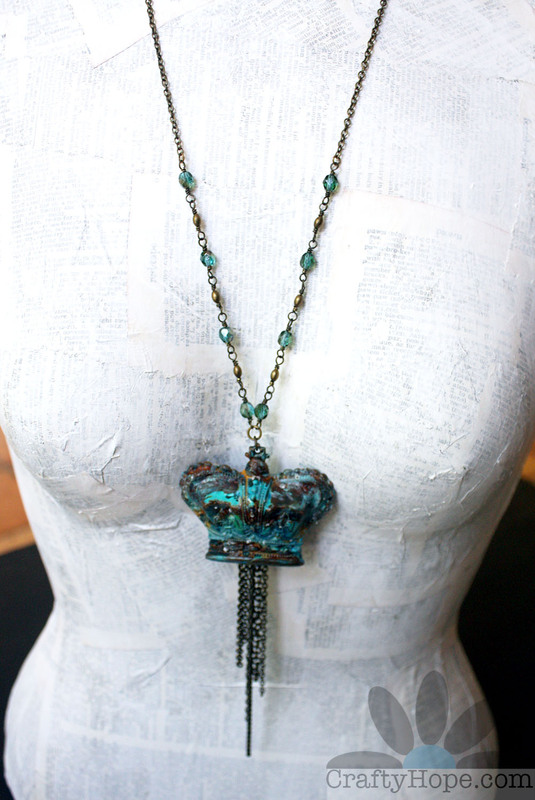 The chain fringe elongates the appearance of the crown pendant, such a good find! I love the earrings and the Gypsy soul necklace - both subtle and with a vibe! 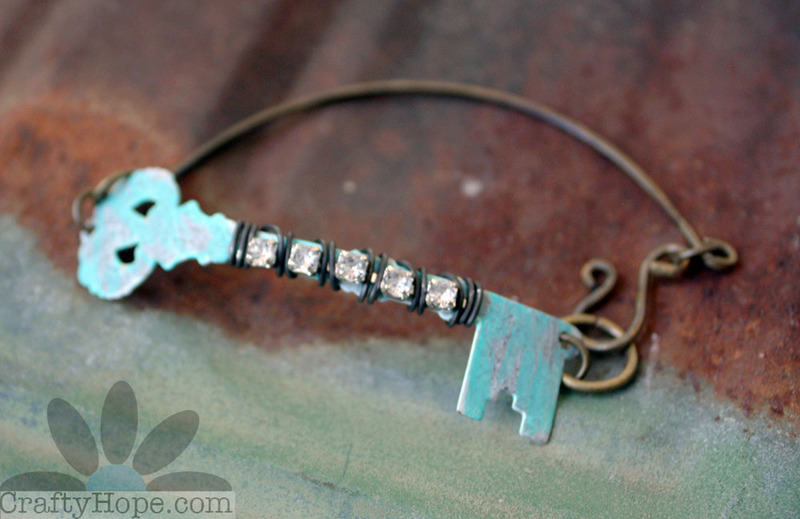 Very clever what you did with the key - love it! Your style has been something I've enjoyed for a while now. The key bracelet though really speaks to me. It's simple, but embellished. Perfect...truly. Adore how you used all of you swap beads. Absolutely love the dragonfly earrings! The key bracelet looks so individual and the crown necklace is fabulous. Aw, thank you! Kari totally sent me some awesome stuff to use. The pieces I made from her mix totally spoke to me. And, I still have so much to play with. Thanks for taking the time to come take a peek!! Great job on all the pieces. My fav is the crown. You had some lovlies to work with. Well done! Really nice work! I like how you incorporated the silk into the earrings! They added some awesome dimension! Uber cool items you created from the Bead soup! You have a wonderful Artsy feel to your pieces! I adore the crown necklace! I just adore it, the key is my 2nd favorite! Tina, Thank you so very much! I'm so pleased you like my designs. I was blessed with a great partner and fortunately found some inspiration too. Thanks for hopping by!! I love the dragonfly earrings!! Everything you made is spectacular.